Define centripetal and tangential acceleration. The centripetal acceleration is the rate of change of tangential velocity. When an object is moving with uniform acceleration in circular direction, it is said to be experiencing the centripetal acceleration. Tangential acceleration is a measure of how the tangential velocity of a point at a certain radius changes with time. Tangential acceleration is just like linear acceleration, but it’s particular to the tangential direction, which is relevant to circular motion. Find the velocity of point B and midpoint C of link AB shown in Figure (1). 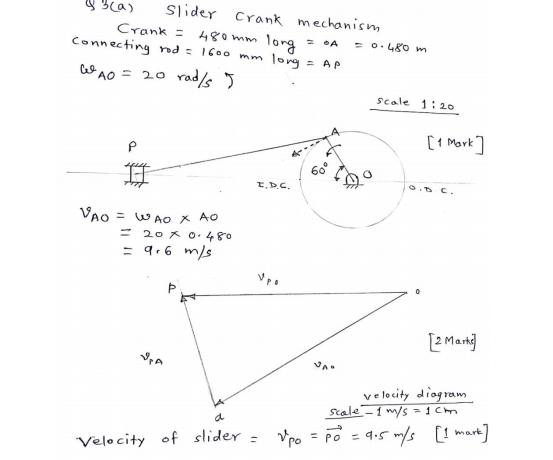 Explain with neat sketch how to find the velocity of a slider in slider crank mechanism by Klein’s construction. In slider crank mechanism, the length of crank OB and connecting rod AB are 130 mm and 500 mm respectively. The centre of gravity G of the connecting rod is 275 mm from slider A. The crank speed is 750 rpm in clockwise. When crank has turned 45 from inner dead centre position determine (i) velocity of slider ‘A’ (ii) velocity of centre of gravity of connecting rod ‘G’. In a four bar mechanism ABCD link AD is fixed and the crank AB rotates at 10 radians per second in clockwise, lengths of the links are AB = 60 mm, BC = CD = 70 mm, DA = 120 mm, when angle DAB = 60 and both B and C lie on the same side of AB, find angular velocities of BC and CD link. In the toggle mechanism as shown in Fig. (2), D is constrained to move on a horizontal path. The dimensions of various links are AB = 200 mm, BC = 300 mm, OC = 150 mm and BD = 450 mm. The crank OC is rotating in a counter clockwise direction at a speed of 180 rpm. Find, for given configuration (1) velocity and (2) acceleration of ‘D’. In a four bar chain ABCD, AD is fixed and is 150 mm long. The crank AB is 40 mm long and rotates at 120 r.p.m. clockwise, while the link CD = 80 mm oscillates about D. BC and AB are of equal length. 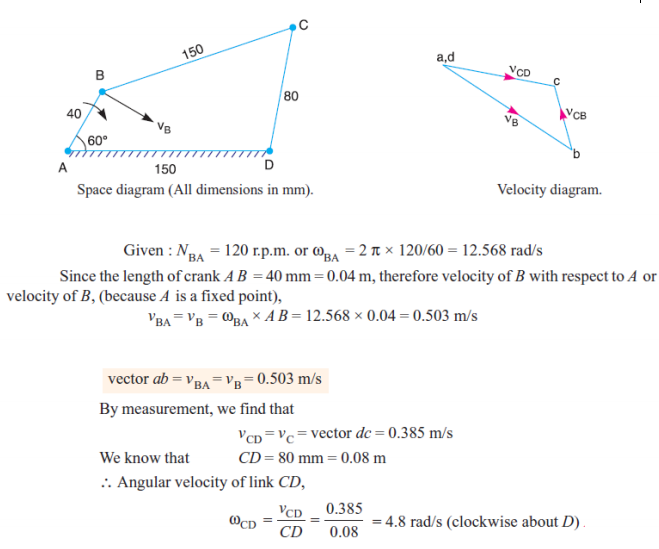 Find the angular velocity of link CD when angle BAD = 60. In a slider crank mechanism, the length of crank OB and connecting rod AB are 125 mm and 500 mm respectively. The centre of gravity G of the connecting rod is 275 mm from the slider. The crank speed is 600 rpm clockwise. When the crank has turned 45 from the inner dead centre position, determine : (i) Velocity of slider ‘A’, (ii) Velocity of the point ‘G’ graphically. The crank of a slider crank mechanism rotates clockwise at a constant speed of 300 rpm. The crank is 150 mm and the connecting rod is 600 mm long. 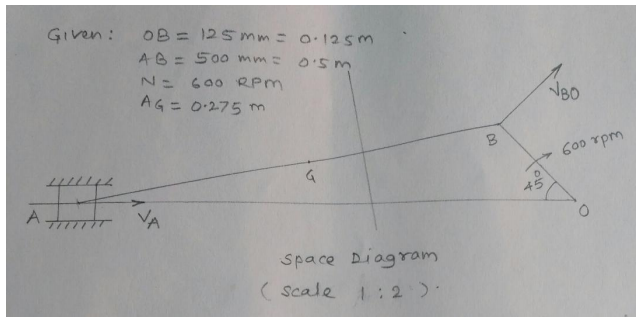 Determine : (i) linear velocity and acceleration of the mid-point of the connecting rod, and (ii) angular velocity and angular acceleration of the connecting rod, at a crank angle of 45 from inner dead centre position. Note: Since D is the midpoint of AB, therefore d' is also midpoint of vector b' a'. Join o' d'. The vector o' d' represents the acceleration of midpoint D of the connecting rod i.e. aD. Explain single cylinder 4-stroke I.C. engine using turning moment diagram. A turning moment diagram for a four stroke cycle internal combustion engine, we know that in a four stroke cycle internal combustion engine, there is one working stroke after a crank has turned through two revolution i.e.7200 . Since the pressure inside the engine cylinder is less than the atmospheric pressure during suction stroke therefore a negative loop is formed. During the compression stroke, the work is done on gases, therefore a higher negative loop is obtained. During the expansion or working stroke, the fuel burns and the gases expand, therefore a positive loop is obtained. In this stroke the work done is by the gases. During exhaust stroke, the work is done on the gases, therefore negative loop is formed. It may be noted that effect of inertia forces on the piston is taken is account. 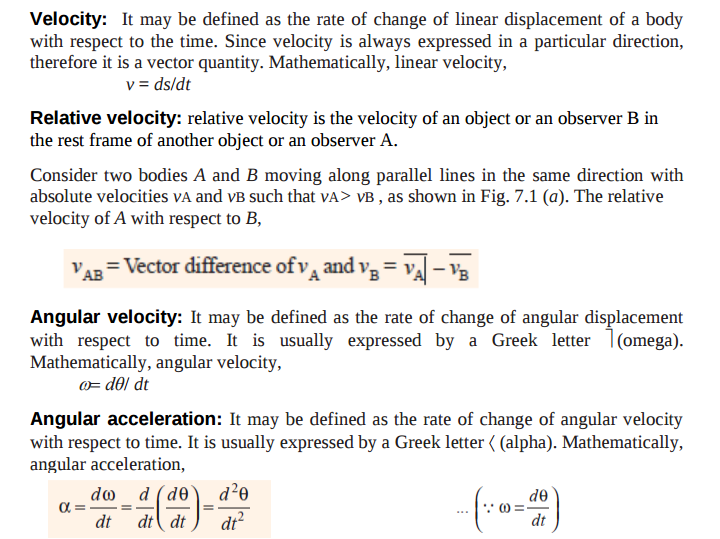 Define linear velocity, angular velocity, absolute velocity and state the relation between linear velocity and angular velocity. 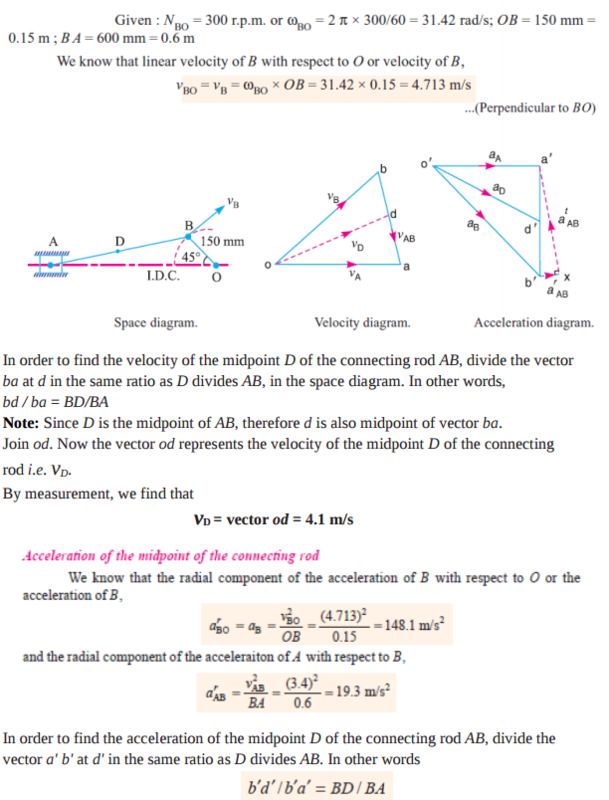 Absolute Velocity: It is defined as the velocity of any point on a kinematic link with respect to fixed point. Relation between v and ɷ: V = r. ɷ Where V = Linear velocity. 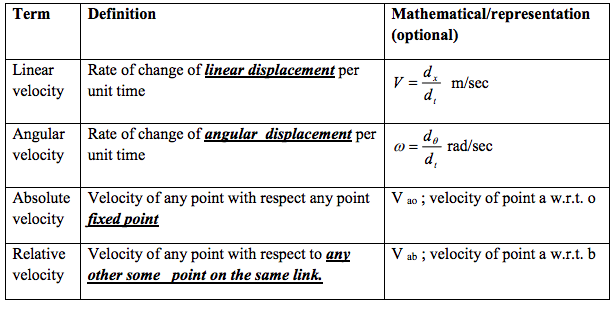 ɷ = angular velocity. r = radius of rotation. 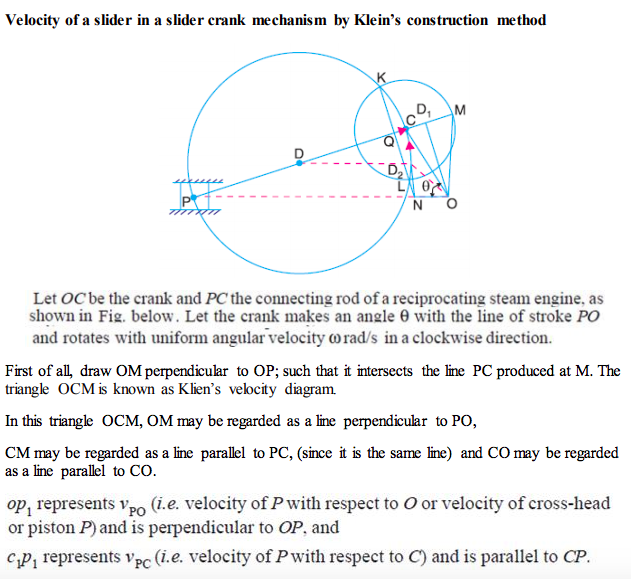 Explain the Klein's construction to determine velocity and acceleration of single slider crank mechanism. In a slider-crank mechanism, the crank is 480 mm long and rotates at 20 rad/sec in the counter-clockwise direction. The length of the connecting rod is 1600 mm. when the crank turns 60 from the inner-dead centre. Determine the velocity of the slider by relative velocity method. In a slider crank mechanism, crank AB = 20 mm & connecting rod BC = 80 mm. Crank AB rotates with uniform speed of 1000 rpm in anticlockwise direction. 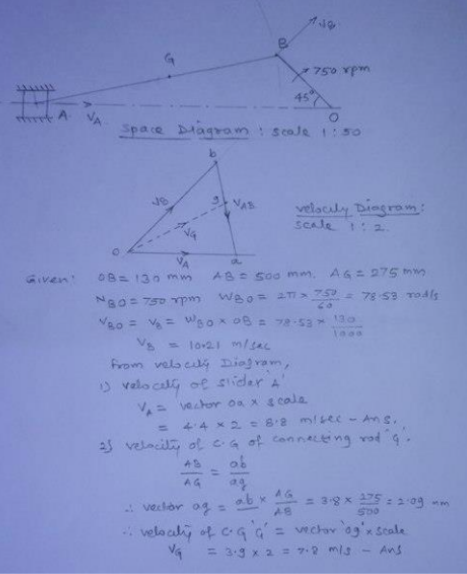 Find (i) Angular velocity of connecting rod BC (ii) Velocity of slider C. When crank AB makes an angle of 60 degrees with the horizontal. Draw the configuration diagram also. Use analytical method. 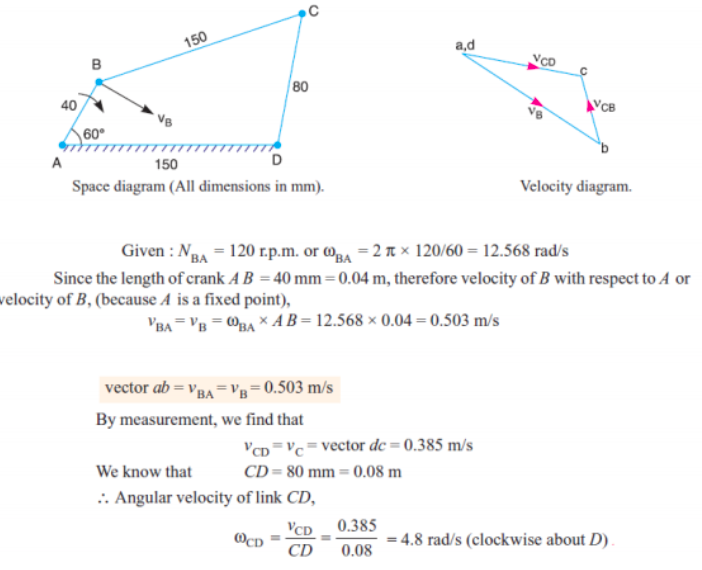 Explain Klein’s construction to determine velocity and acceleration of different links in single slider crank mechanism. The crank and connecting rod of steam engine are 0.5m and 2m long respectively. The crank makes 180r.p.m. in clockwise direction. When it has turned through 45° from I.D.C. 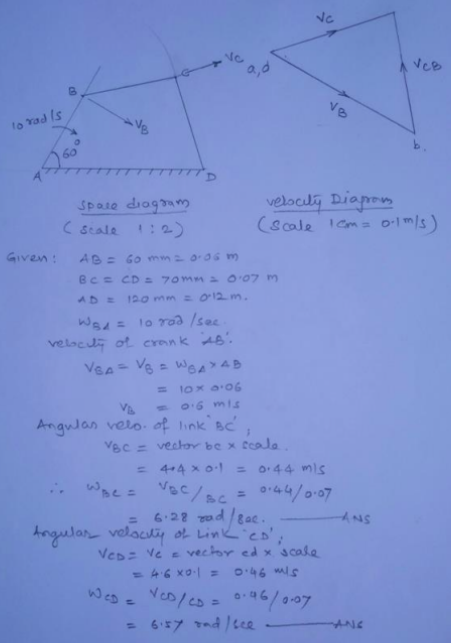 Find the velocity of piston and angular velocity of connecting rod by relative velocity method. In a slider crank mechanism the length of crank and connecting rod are 100mm and 40mm respectively. The crank rotates uniformly at 600 rpm clockwise. Then crank has turned through 45° from I.D.C. Find by analytical method. 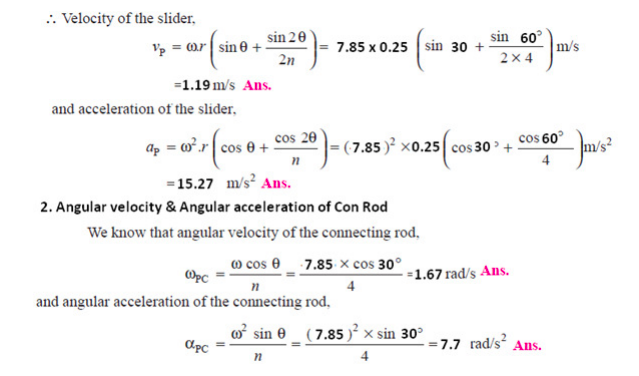 (i) Velocity and acceleration of slider (ii) Angular velocity and angular acceleration of connecting rod. PQRS is a four bar chain with link PS fixed. 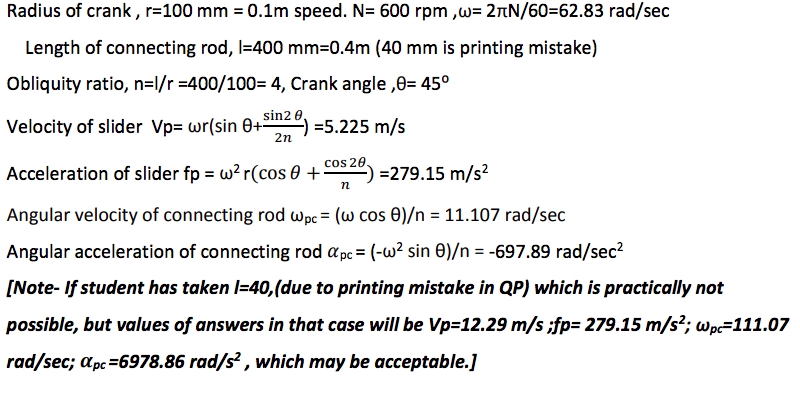 The lengths of links are PQ = 62.5mm, QR = 175mm, RS = 112.5mm and PS = 200mm, The crank PQ rotates at 10 rad/sec clockwise. 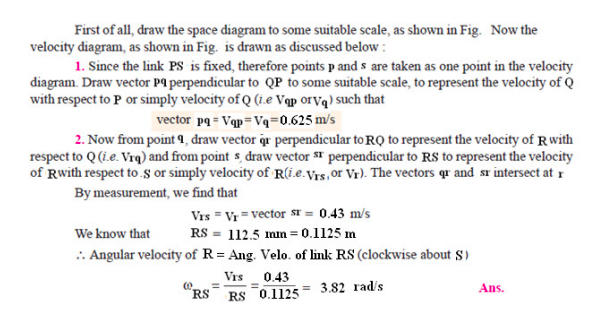 Draw velocity and acceleration diagram, when angle QPS = 60° and Q and R lie on the same side of PS. 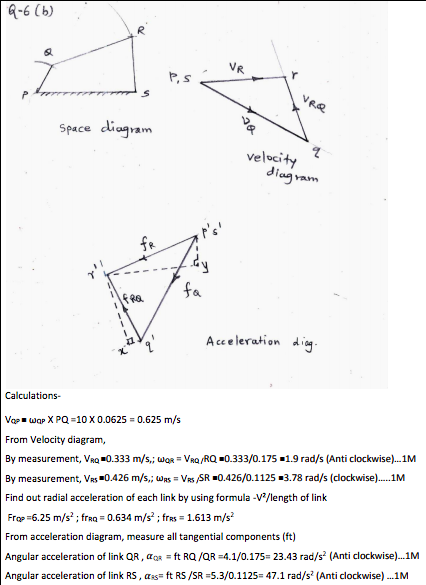 Find the angular velocity and angular acceleration of links QR and RS. 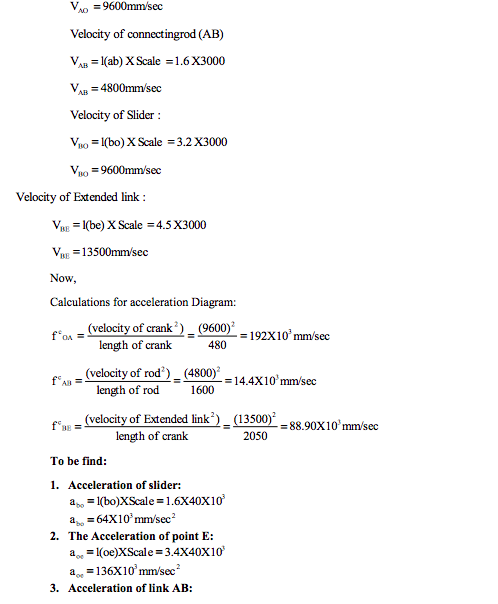 Describe stepwise procedure for determination of velocity and acceleration by Klein’s construction with suitable data. 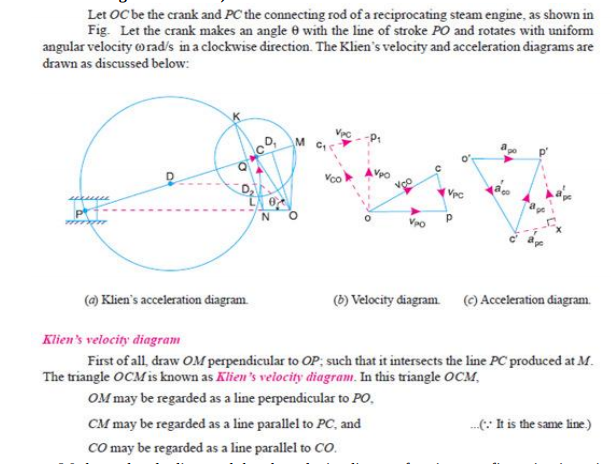 Klein’s construction is a simpler construction to get velocity and acceleration diagrams. For example : for reciprocating engine mechanism OPC. draw a circle with PC as diameter as shown. 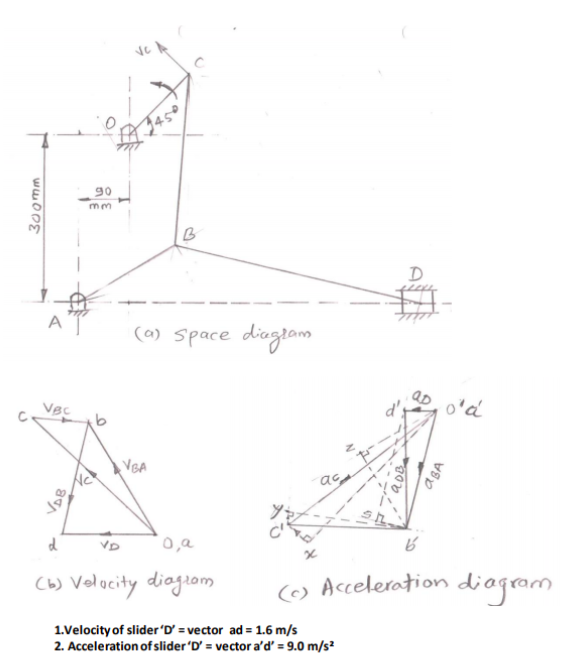 and obtain velocity diagram OCM ie. produce PC to cut perpendicular to line of stroke in ‘M’ . 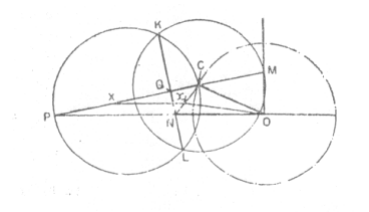 Draw another circle with ‘C’ as center and “CM” as radius cutting the first circle in points K and L. Join “KL” which is the chord common to both the circles. Let it cuts PC and OP in “Q” and “N” respectively. 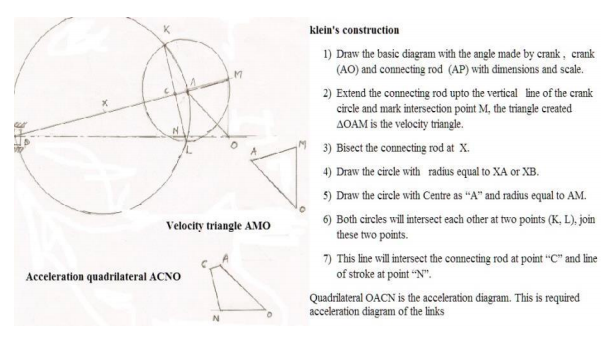 Then “OCQN” is the required quadrilateral which is similar to acceleration diagram. PQRS is a four bar chain with PS fixed length of links are PQ = 62.5 mm, QR =175 mm, RS = 112.5 mm, PS = 200 mm. The crank PQ rotate at 10 rad/sec. in clockwise direction. 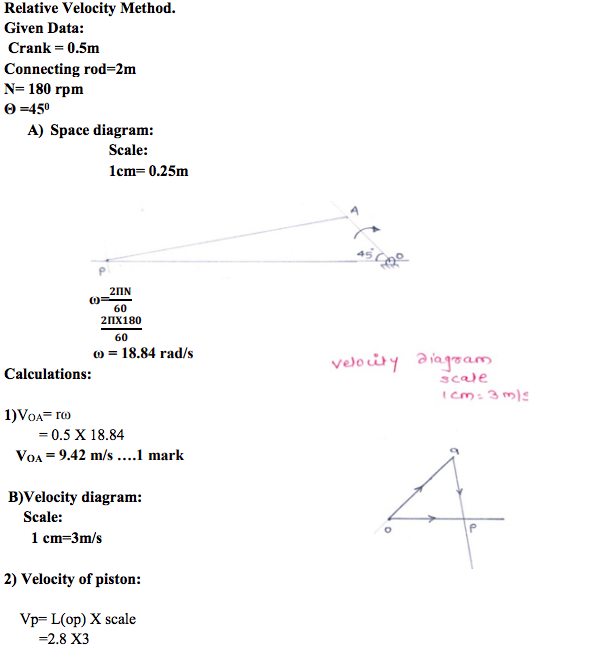 Determine the angular velocity of point R, graphically by using relative velocity method. In reciprocating engine the crank is 250 mm long and connecting rod is 1000 mm long. The crank rotate at 150 rpm. 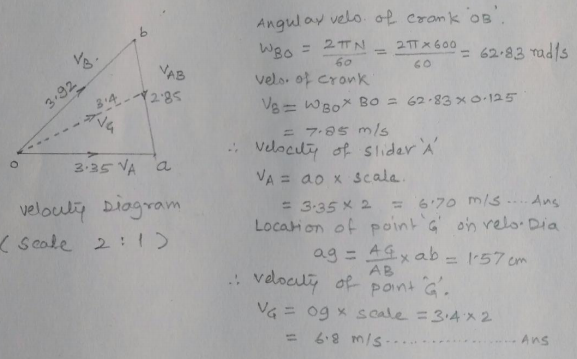 Find velocity and acceleration of piston and angular velocity and angular acceleration of connecting rod when the crank makes an angle of 30° to IDC. Use analytical method. 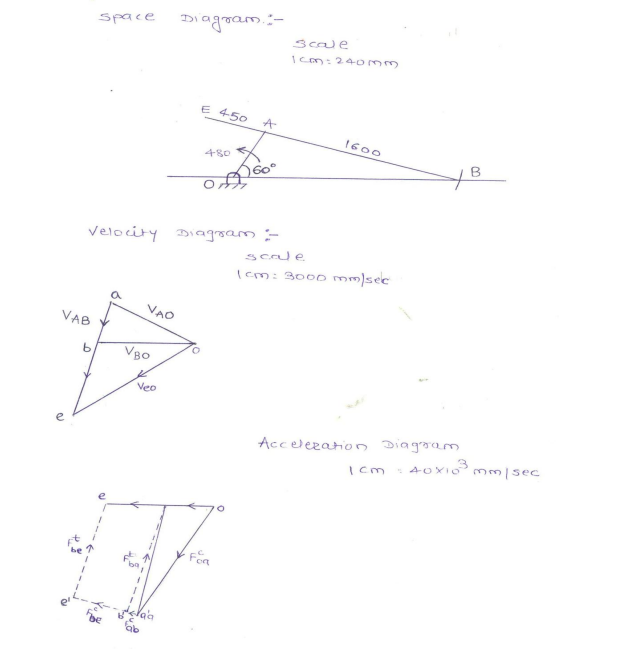 Define the terms linear velocity, relative velocity, angular velocity and angular acceleration. For a single slider crank mechanism , state the formulae to calculate by analytical method – Also state the meaning of each term. n- l/r = ratio of length of connecting rod to crank radius. Where, αpc is angular acceleration of connecting rod. The crank and connecting rod of a reciprocating engine are 200 mm and 700 mm respectively. The crank is rotating in clockwise direction at 120 rad/s. 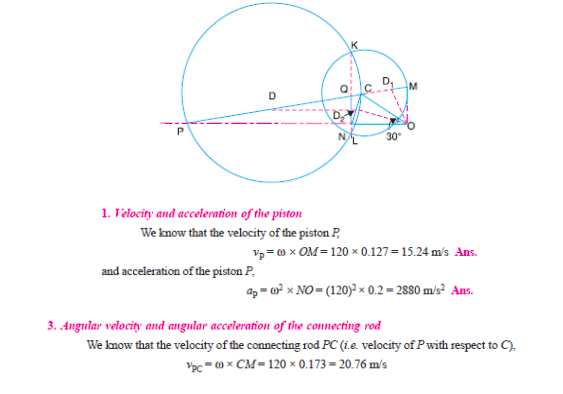 Draw Klein’s construction and find (i) Velocity and acceleration of the piston (ii) Angular velocity and angular acceleration of the connecting rod at the instant when the crank is at 30° to IDC (inner dead centre).